Increase your opportunity to win big on your RFP sales proposals AND reduce your workload when putting them together. The trick is to find those GREAT opportunities, collaborate with professionals who have value added skills, and design a professional sales proposal package. 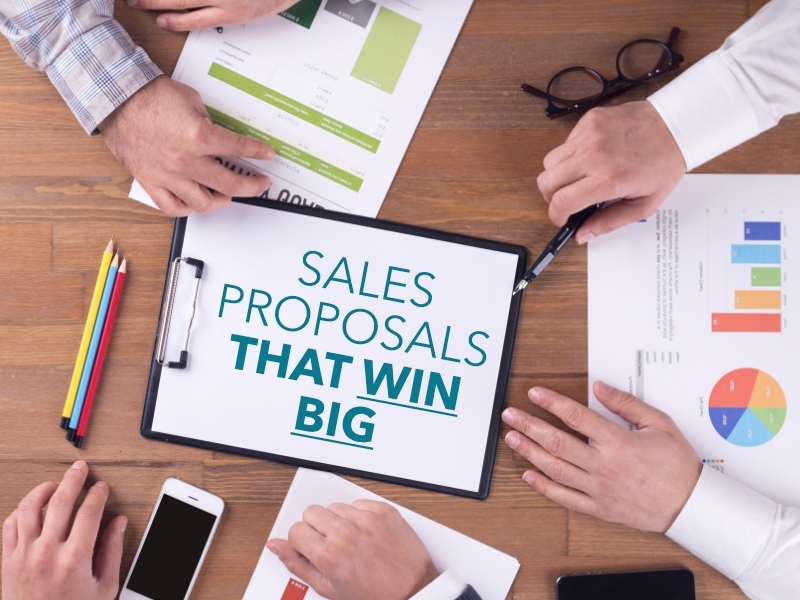 If you are a business owner or consultant who has ever submitted a proposal, either in response to a publicly solicited RFP, or a large sales proposal for a prospective client, you know it is a lot of work with no guarantee that you will win the job. Some organisations have a dedicated staff member to put together the proposal, but most small business owners and independent consultants are on their own. And even if you do have a dedicated person for the job, sales process efficiencies are important; time is money. Bid opportunities are often passed over, but they don't need to be! Opportunities to bid on a project are often passed over because there isn’t enough time to put the proposal together or the investment of time to put the proposal together outweighs the probability of winning. The other reasons to pass over a bid may be that you just don’t have the mandatory skills needed to be able to submit. Going outside your traditional network to find collaborative partners will increase your opportunities to be part of a winning team and win jobs. There are a variety of skills needed to put a bid together. First, you need the subject matter expertise, education, and skills to do the job, which most people reviewing potential bids opportunities have, but those background skills are just as important to increase your opportunity to produce a winning bid. Stand out from your competition! You only have one first impression. You may have everything they are looking for, but how your proposal looks is a reflection of your company including the ability to pay attention to details. Writing, graphic design, and marketing are essential skills needed to create a better-than-average proposal. A professional looking bid submission package formatted in a way that is easy to read and engaging; as well as, having audience-appropriate writing, are critical to putting together a winning proposal. At GAEL, we work as a team of facilitation experts that offer our clients both subject matter in our focused topic of environmental sustainability, as well as graphic design support. Yes, we both can facilitate workshops and stakeholder meetings for our clients, but when we work together, we provide so much more. One of us can focus on being attentive to the audience at all times, while the other person can spend the time to provide detailed graphic documentation, in words and visuals. Based on customer feedback, we know that we are providing a better than average results and experience when we work together. This example is just one way an unusual and collaborative partnership can produce exceptional results and add value to a job. Improve the efficiency of your bid process. More bids = more opportunities. Set up email alerts on tender sites to get notified of any opportunities that match your criteria. 2. Provinces - municipalities often post on their websites as well. Be prepared! Develop relationships with potential bid partners BEFORE you actually need them. Look to your professional network to see if they would be interested in collaborating on a bid. If they don’t need anyone on the current bid, agree to share cv’s and connect on LinkedIn for future opportunities. Connect with people on LinkedIn. Use the search field to find people. Once you find them, you can ask to be introduced if you are connected through someone, look to see if they have contact information on their public profile or send an inMail. You can also join a relevant LinkedIn group and join in the conversations. Groups are valuable ways to engage with people that share your interests without being a part of their network. Find people through a Google search of the company and then look for team information that is available on most company websites. If the email address is not available, take the information and plug it into the LinkedIn search to find more information. Include all the right information without overdoing it. Read all requirements carefully and submit all requested information. Only provide additional information when you believe it will add value to the success of the project, and nothing more. Be careful to review what you are allowed to submit. Some bid tenders are very specific on the length of the proposal, how it should be formatted. If you aren’t sure about something, ask! Each tender will note who and how to contact the organisation to answer any questions. Read all addenda as soon as they become available. Addenda is available to provide critical changes to the bid that may influence your submission; including answers to questions that you may have. Make sure your proposal looks good! First impressions are important, so make sure your proposal looks professional. Create a proposal template that has the core information and is branded with your logo and company colours; eg. title page, table of contents, page numbers, company profile, team bios, pricing tables, etc. You will need to customise the information for each proposal, but having a formatted template and core information already in place will save time. To save time and money, choose a business proposal template from professional graphic designs available on sites such as Envato. I often recommend my clients to pick a few sample templates that have content pages they need (eg. proposal timelines, multiple team member bios, etc.) and then we focus on brand their template with their brand and core content. Take the time to review and update marketing materials ahead of time will save time during the submission process. Product or service brochures or technical documents are some marketing materials that may be supporting documents that can be included as appendices. As well, you can be sure the organisation reviewing your bid will check.